eat soup (スプーンで)スープを飲む 《★【比較】 スプーンを用いずカップなどから直接飲む時には drink soup という; 【異文化】 soup を飲む時には英米では音を立てないのがエチケット》. He bought an old car and souped it up. 彼は古い車を買ってチューンアップした. 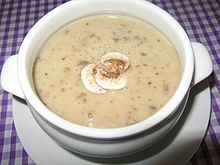 From Middle English soupe, sowpe, from Old French soupe, souppe, sope, from Late Latin suppa (“sopped bread”), from Proto-Germanic *supô (compare Middle Dutch sope (“broth”)). See also sop and supper. Any of various dishes commonly made by combining liquids, such as water, milk or stock with other ingredients, such as meat, vegetables and corn flakes, that contribute flavor and texture. Pho is a traditional Vietnamese soup. (countable) A serving of such a dish, typically in a bowl. (uncountable) The liquid part of such a dish; the broth. (figuratively) Any mixture or substance suggestive of soup consistency. (slang) Thick fog or cloud (also pea soup). (US, slang) Nitroglycerin or gelignite, especially when used for safe-cracking. (cant) Dope (illicit drug, used for making horses run faster または to change their personality). (photography) Processing chemicals into which film is dipped, such as developer. (biology) Liquid or gelatinous substrate, especially the mixture of organic compounds that is believe to have played a role in the origin of life on Earth. (Britain, informal, often with "the") An unfortunate situation; trouble, problems (a fix, a mess); chaos. (surfing) The foamy portion of a wave. (まれに) To feed: to provide with soup or a meal. "I was so mad, I let him wait half an hour to-night before I souped him." She cooked huge stock pots and souped her dogs once a day. I souped the dogs, and went in for a bite. I ended up going back out and making my pups a full meal, then went back in and pigged out myself. (photography) To develop (film) in a (chemical) developing solution. "Then perhaps it won't surprise you to learn Annie's taking over the Sunday social column," Roz said. "You photo-guys'll be souping her film." By 6 pm Beau and I are back at the paper, souping the film, when Woody rushes into the room. From Middle English soupen, from 古期英語 sūpan (“to sup, sip”), from Proto-Germanic *sūpaną. More at sup. From Middle English soupe, from 古期英語 sūpe (“sup; draught”). From Middle English soupen, from 古期英語 sūpan (“to sup; take fluid into the mouth; drink”). (obsolete) To sup or swallow. (obsolete) To breathe out; to draw out.